"Now they are also putting in their two cents’ worth!” (trans. note: “Senf” = English “mustard”, i.e., a literal translation would be “adding their mustard") You might be able to say that given the glut of bands rushing to reach the top, undaunted in trying their luck on the increasingly chaotic music market. One more "youth-researches-combo"; which number of how many? But whoever can stick the quality seal of Jazz thing Next Generation on his CD cover and, moreover succeeds in putting the sequential number 70 in a long line of outstanding talented musicians, i.e., a small anniversary, should by no means be laid aside unheard! Six exceptional, creative next generation musicians already exceptional due to their individuality from all corners of the southern German and Austrian scene, a fun community that is based on a deep-rooted kinship: that’s the Kammerer OrKöster. The name already indicates that it is certainly not a matter of following the usual rules. The two band founders Richard Köster (trumpet/flugelhorn) and Jakob Kammerer (drums) as well as Beate Wiesinger (bass), Alois Eberl (trombone), Christian Amstätter-Zöchbauer (bass trombone) and Benjamin Daxbacher (alto saxophone) do not need a harmony instrument. They much prefer putting the chords in the voices of a very rare brass section. What results is both unusual and unique: 10 brazen compositions with titles such as "Burgler Boogie", "Meditationblues", "Die Birke", "Der Nilolaus ist da" and "Farewell Well Well" between a casual attitude and sublime elegance, between Alpine humor and urban profundity, between irresistible groove and filigree virtuosity, between nostalgia-free tradition and down-to-earth modernity. "For us, jazz in 2017 primarily means versatility," Richard Köster makes unmistakably clear. "Every time we meet, each person brings new ideas and influences from his or her surroundings. Jazz for us also means that we then try to make something new out of our ideas and to be as open as possible in the process. "That's why the word ‘jazz’ for us stands even more for a setting and approach to music than for one particular sound aesthetics or music genre.” The six are passionate tinkerers who experiment with sounds and their effects. Because their performances are always spontaneous and full of lust in spite of that, they won the International Burghausen Jazz Next Generation prize in 2016 and are rightly celebrated by the audience at each of their concerts. 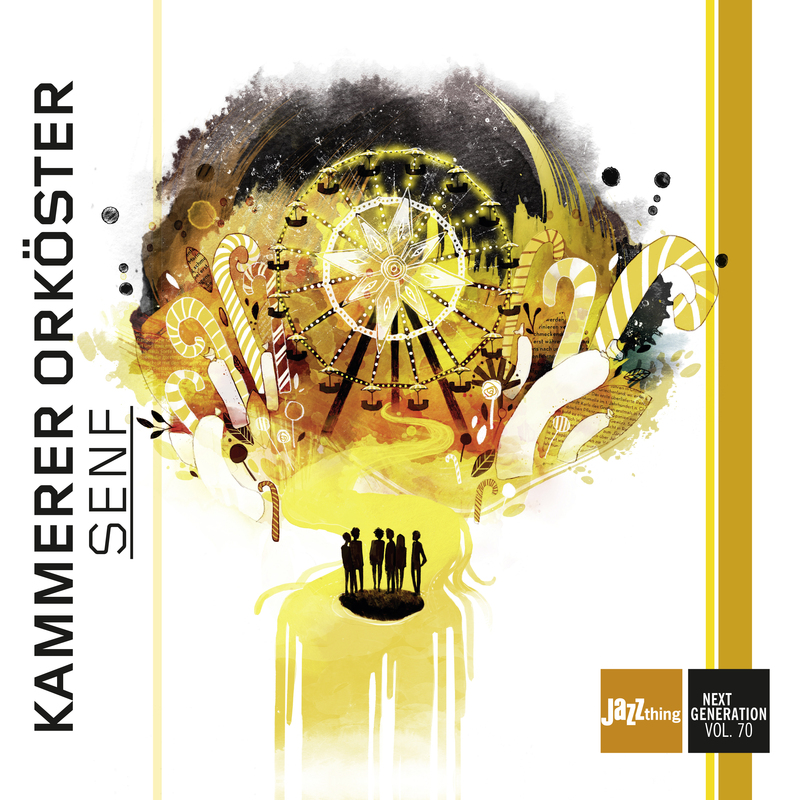 The trick was to capture the fascination of the Kammerer OrKöster, which in principle optimally functions as a well-rehearsed live band, for its debut CD. "Our music lives at the moment and thrives on quick decisions as well as the magic of the moment," Richard Köster emphasized. "Consequently, our goal was to structure the recording and also the artwork, so that you have the feeling of being there live when you listen to it.” In a best case scenario, it flows into a pleasant roller coaster of emotions. A violently swinging uptempo number rises abruptly from a dabbling avant-garde intro, the lyrical searching of the wind players transforms into a steamy dance number, a well-camouflaged New Orleans brass band mutates suddenly into a Bavarian brass band within only a single bar. Such fresh, courageous, intelligent, and authentic instrumentalists as those of Kammerer OrKöster are more than welcome to put in their two cents’ worth, i.e., add their tasty “Senf” (correct pronunciation: "Sempft", in Bavarian-Austrian dialect), to the current scene in the future. They represent as only a few other ensembles the daring and the joy of playing of the new jazz generation. More of this please! "... the music is a tasteful mixture of trumpet, alto sax, two trombones and a rhythm section."